The Caledonian pine forest was the dominant natural vegetation on the lower slopes of the Highlands. The earliest Scottish sawmills were built in the Highlands in the 16th and 17th centuries. By the 1560s there were already concerns that the resources might soon be exhausted. There were sawmills in Glenmore by the 1680s. 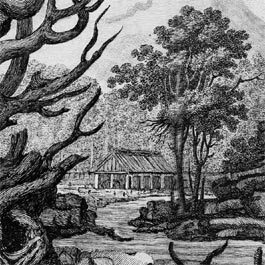 This sawmill, pictured in the late 18th century, is a detail within a view of wild, romantic scenery. It has open sides with columns carrying the roof, and would have been built from local materials. Heavy, crude saw-blades, mounted in moving frames, were driven from water wheels. From mills such as this, timber was floated down-stream to where it could be shipped to markets.